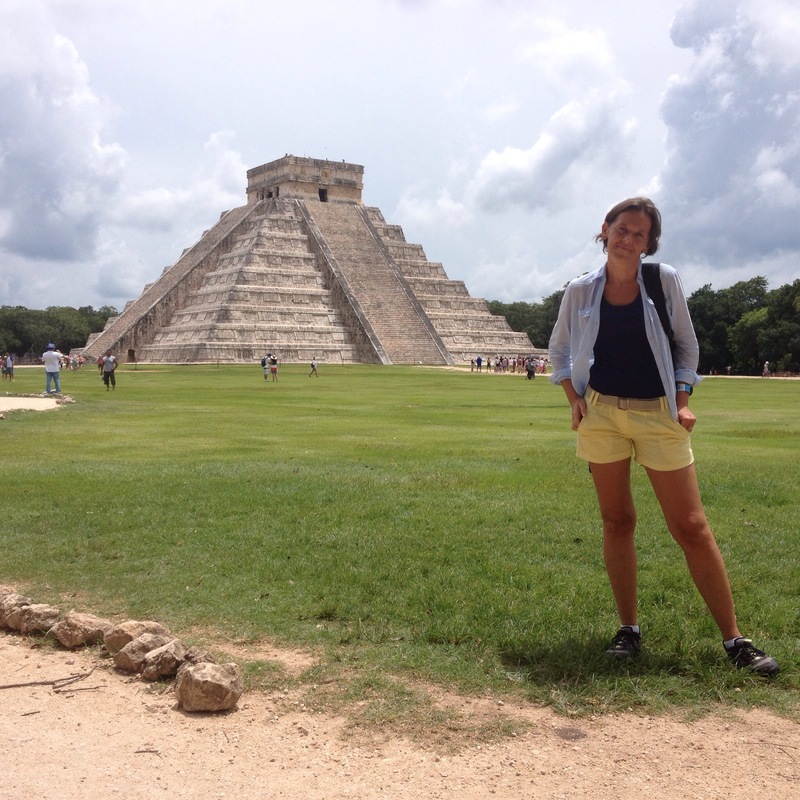 Visiting Chichen Itza is a must when you are in Yucatan, however, our trip to Chichen Itza turned out to be a little adventure. We were to be picked up between 7:20 – 7:30 am from Aventura Mexicana, however nobody showed up. Nice start we thought. Then Marcin decided to go on the corner of the street and look for our transport. And yes, there it was, a mini van waiting for us. 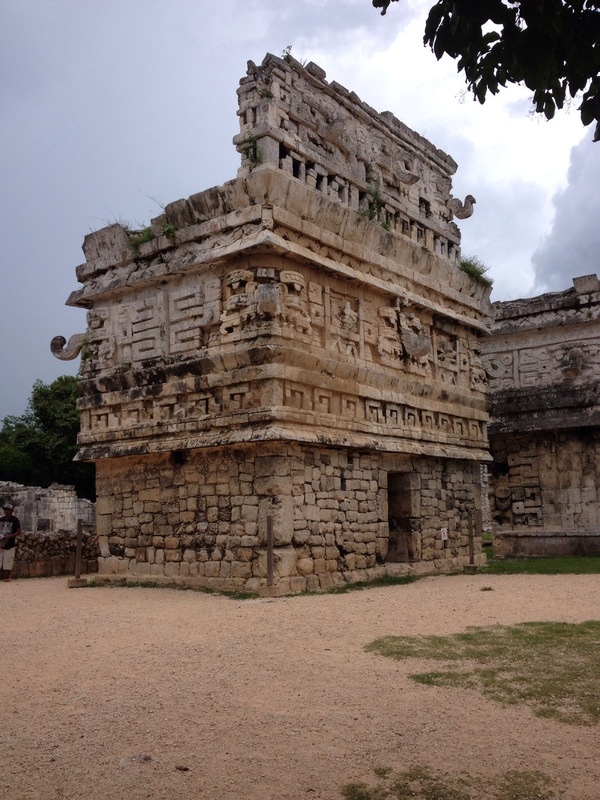 We got inside the van ready for a visit to Chichen Itza. Unfortunately, our journey was not too long, in Tulum (about sixty kilometers from Playa) our bus stopped again because it simply broke down. We and the other passengers had to change into mini vans but the whole process took ages. We were late and all plans changed. There was no information what was going on so I had to ask in Spanish. The driver told me that we had to change the means of transport. Finally, the mini vans arrived and from that moment our journey started for good. The people who travelled with us in the van spoke mainly Spanish, there was also a German couple and a girl from Russia. We got our guide with funny pronunciation and peculiar grammar. All past forms simply got ending -ED and the numbers were pronounced in such a way that we did not know what dates he (the guide) was talking about. All in all, it was quite ok.
We manged to see more or less everything and it was becoming darker and darker. There were lots of clouds and the vendors from Chichen Itza stateted covering their goods with plastic bags and covers. We decided to go to the exit. We reached the exit when the first heavy drops of rain began falling. Then I saw a mail box. I said to myself “It is your chance to send some postcards home, that is the first mail box in Mexico you have seen.” I bought some postcards and stamps, wrote some greetings and threw the postcards into a mail box. The rain intensified but it was time to be back in our mini van. We began running and quickly reached our mini van. Then it was time for very late lunch. We got to a bar and were offered some typical Mexican food and fruits. 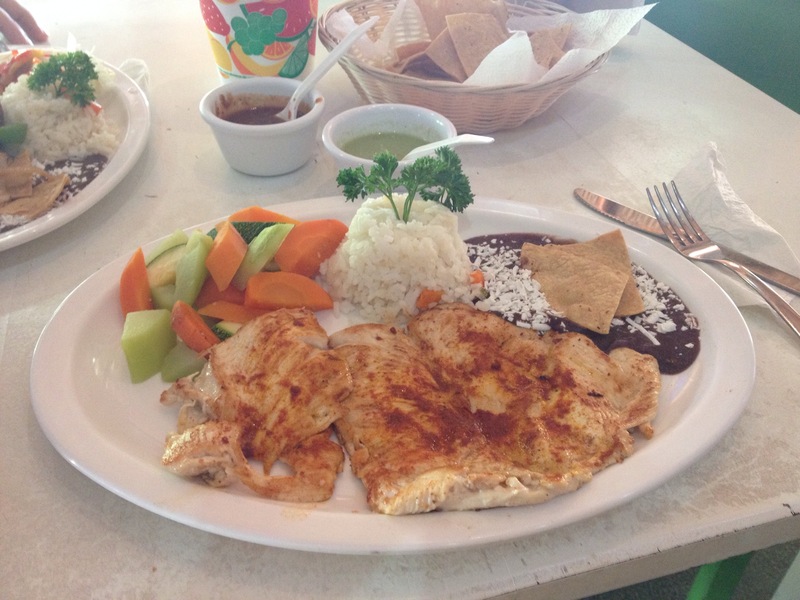 The food was OK but the best was a chance to talk to some Mexicans and practice Spanish. I was so excited that somebody wanted to talk to me in Spanish. Well, after lunch there were still two places to stop and visit. A Cenote which is a kind of natural hole in the ground full of water and surrouned by plants and a city of Valladolid. Unfortunately, it was raining in Cenote and it was cold, so we just took some photos. In Valladolid, the sun appeared so we had a short stroll. Then our long return to Playa began for good. 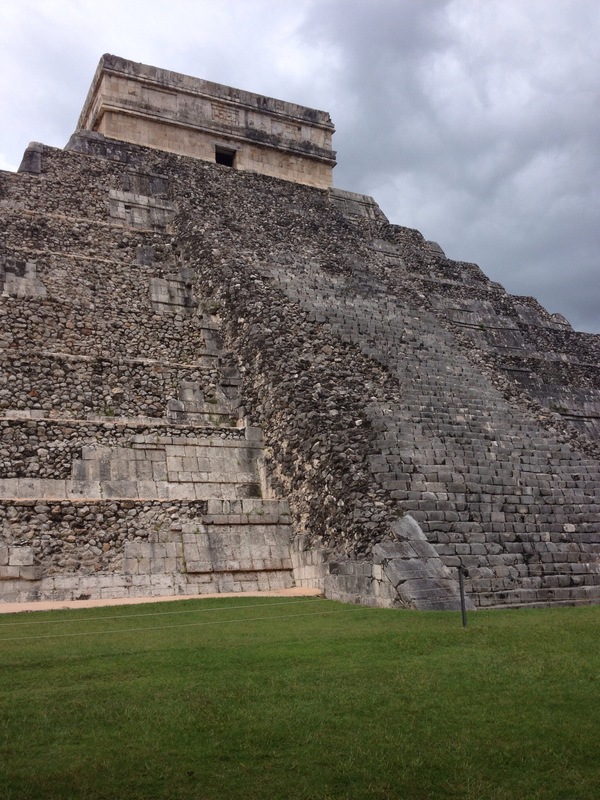 We set off to Chichen Itza at 7:40 am, we came back at 9 pm. It was a long but fruitful day. Dolphins – one of the most intelligent and clever animals of the seas and oceans are unfortunately very exploited here in Mexico. There are many Aquaparks in the Yucatan Peninsula, offering dolphin encounters and the question arises how much can those animals stand? They are imprisoned in their little pools, two, three hundred meters from their home – the Caribbean Sea. They must interact with humans for many hours per day, and nobody will tell me, that they love human interaction. The parks and the dolphins treatment is really curel. 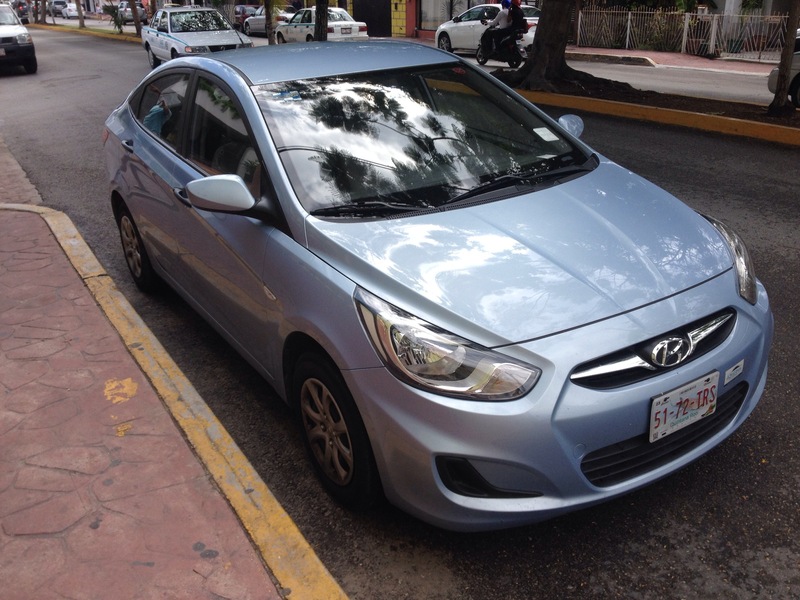 Car renting in Mexico is cheap but it is time consuming and funny. We rented a hyunday for 24 hours and paid 35 dolars. The price included insurance. 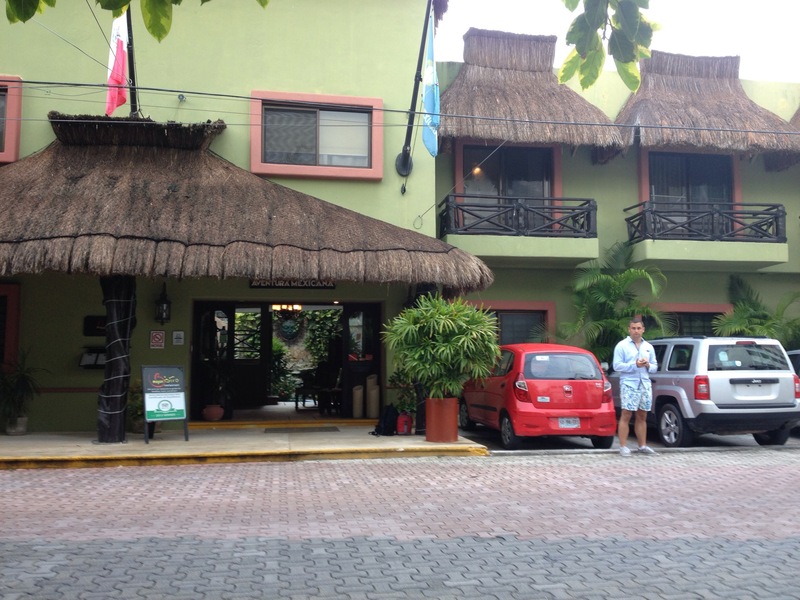 The car rental also blocked 9000 pesos on our credit card. The money was unblocked when we returned the car. There were a lot of documents to sign and the funniest moment was when we had to confirm that the car had four tyres, antenna, hubcaps, registration plates, etc. We also had to mark some scratches on the car’s body. Our car turned out to be quite reliable and economical. When it comes to petrol, the prices are cheaper than in Europe. One litre of petrol costs 12,5 -13,5 pesos. 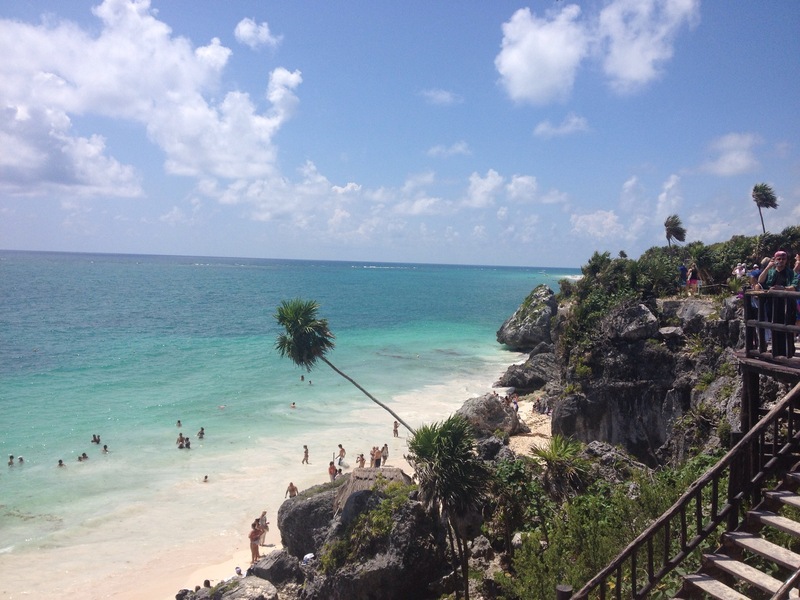 There are two places worth visiting near Playa del Carmen, namely: Akumel (about 25 km from Playa) and Tulum (about 60-65 km from Playa). Akumel is famous for a cove with incredible water and turtles. Even in the Maya language, Akumel means “the place of turtles”. Both me and Marcin decided to swim and dive in Akumel. Marcin was lucky because he encountered a turtle and a ray, I saw two rays only. It is possible to park the car near the beach in Akumel. The price is 20 pesos an hour. 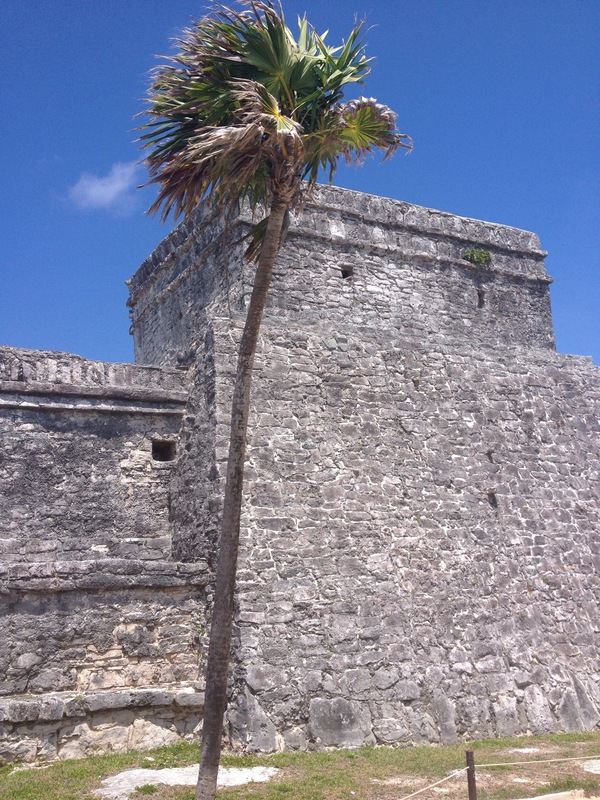 When it comes to Tulum, it is a must see when you are in the Riviera Maya. 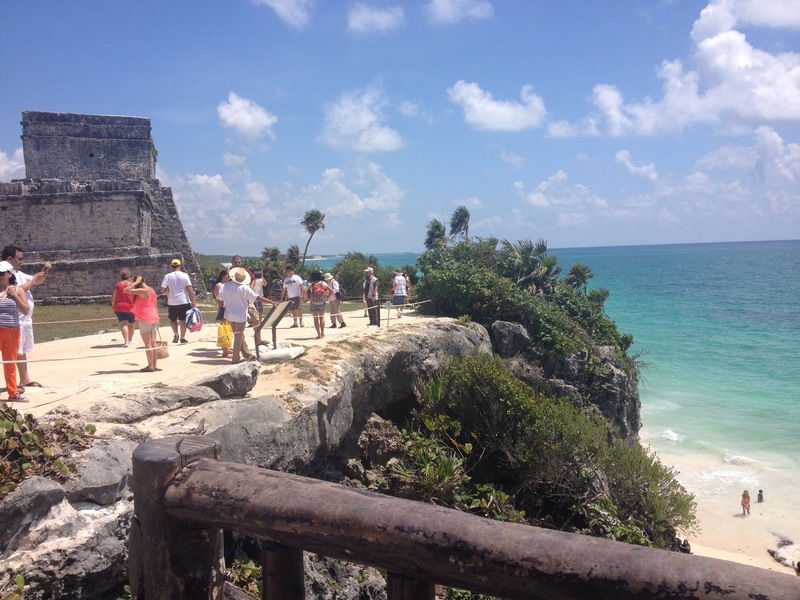 There is a beautiful cliff overlooking the Caribbean Sea with the Mayan Ruins dating back to 13-15th century. 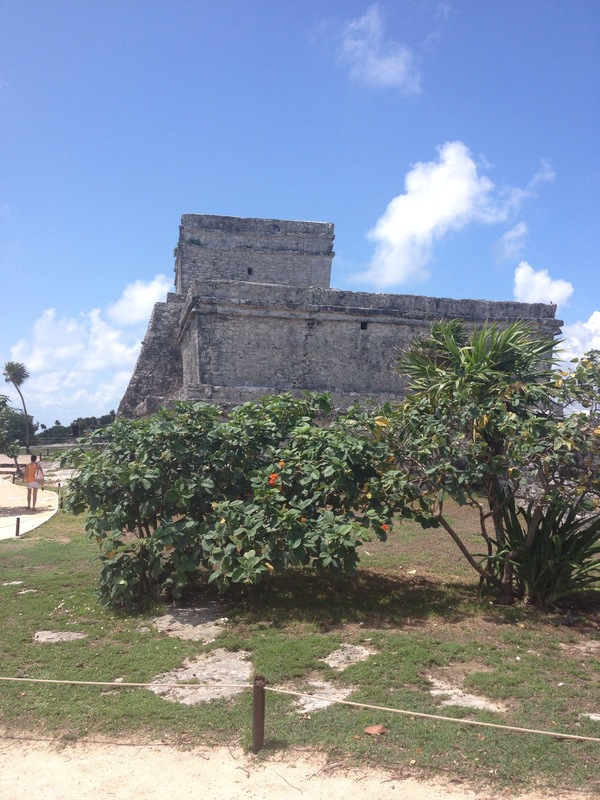 Tulum means “the place of the rising sun”, and the ruins are situated to the east, so they were the first to get the morning sun. 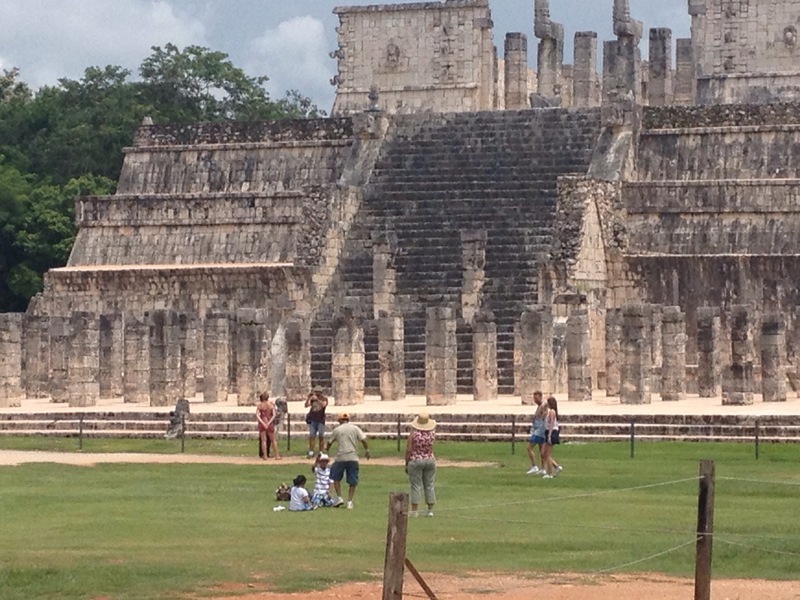 To visit the ruins one has to pay 59 pesos. There are guides available for those interested in history of this place but I always prefer sightseeing on my own. One cannot bring the tripod as the authorities fear that comercial photos will be taken and sold. It is very hot there, so water is necessary. For those who want to swim and dive there is such an opportunity as there is a staircase leading to a secluded beach. Me and Marcin love animals and we love encounters with them. After swimming with whale sharks, we asked ourselves a question: “Who controls the whale shark adventure business? Who cares about the animals? When we went diving, there were about twenty boats around, each with 10 or 12 people. The boats are small, but have powerful and loud engines plus screaming people on board. There is one more negative aspect: PETROL which is in the water and in the air and simply must have a negative influence on the whale sharks. I hope that there are some rules connected with organising the encounters with the whale sharks, however, I also know that sometimes money and profits make people blind. The local people should realize that their sea is magical and they should take care of its creatures before it is too late. 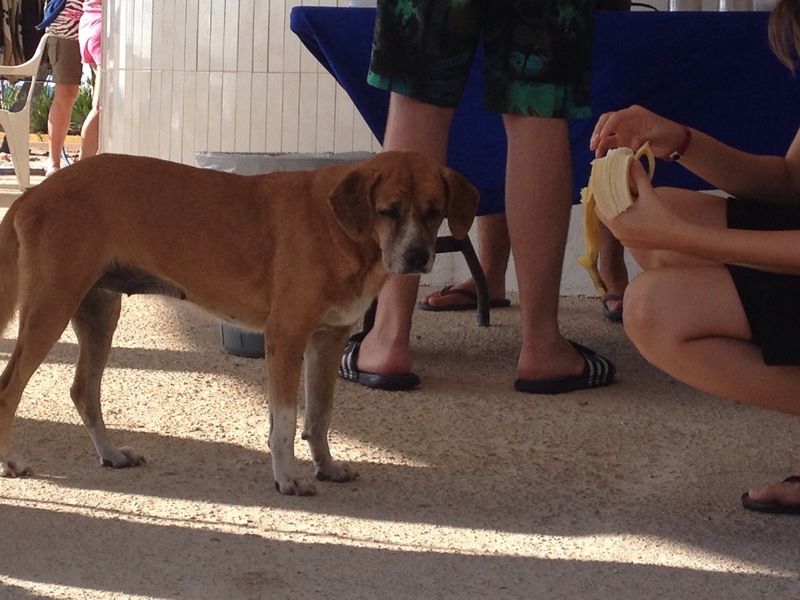 Below, there is a photo of a stray dog in Cancun, near the docks of Ocean Tours boats. The dogs who live there, are the ones which benefit from the whale shark business as they are fed by the tourists. 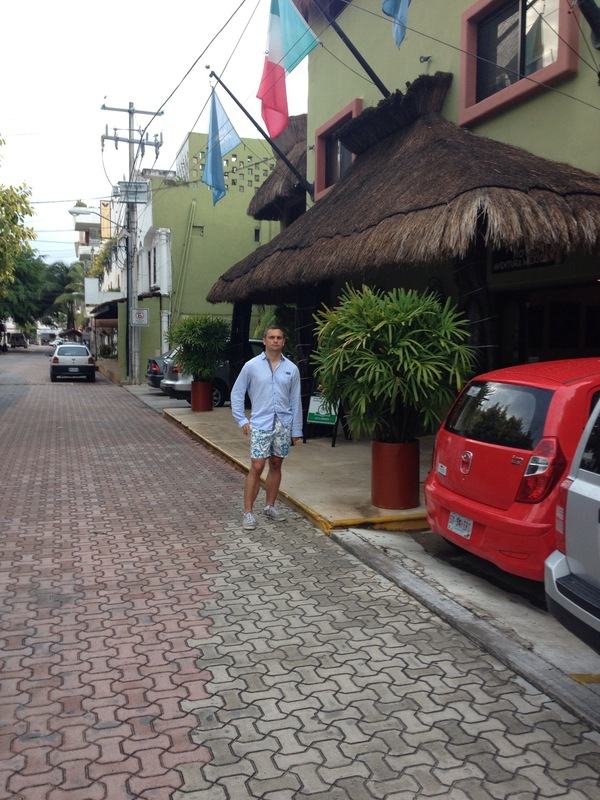 Playa del Carmen is a safe place. One can walk through main streets at any time of a day or night. There are police officers patrolling the streets all the time so tourists feel safe and secure. Below the entrance to our hotel – Aventura Mexicana. When we travel around the world, we always feel inferior to the people from western Europe, Americans or the Japanese. The reason is money. They earn much more and can afford more, we earn very little in comparison to them. Unfortunately, we can’t afford many things and we have to plan in advance or think twice before we spend some cash. In our case, going for a trip or visiting a new country is connected with saving money for a long time. Money does not give health or real happiness but it helps and open diffetent doors. A good example is our whale shark adventure. We paid $280 in total to see those incredible animals, however, the people who went with us: Germans, the French girls and a Dutch young man were caught into a marketing trap, spent much more cash and got first class treatment and service. Numer one on our boat belonged to the French girls who decided to rent wetsuits for $15. Then there were the Germans who bought four long-sleeved T-shirts (which amounted to $100) and the Dutch. We did not spend a penny so we got number five, which meant the last in the water or the invisible ones. Ocean Tour guides Alex and Carla forgot about us (I mean our turn in water) twice. I had to remind them that we also want to see and dive with a whale shark. Had we spent some cash at the beginning of a trip it would have been different. Ocean Tours is a well-prospering business bringing millions of dollars to its owners. I suppose it is not in local hands. I guess it is an American Business. 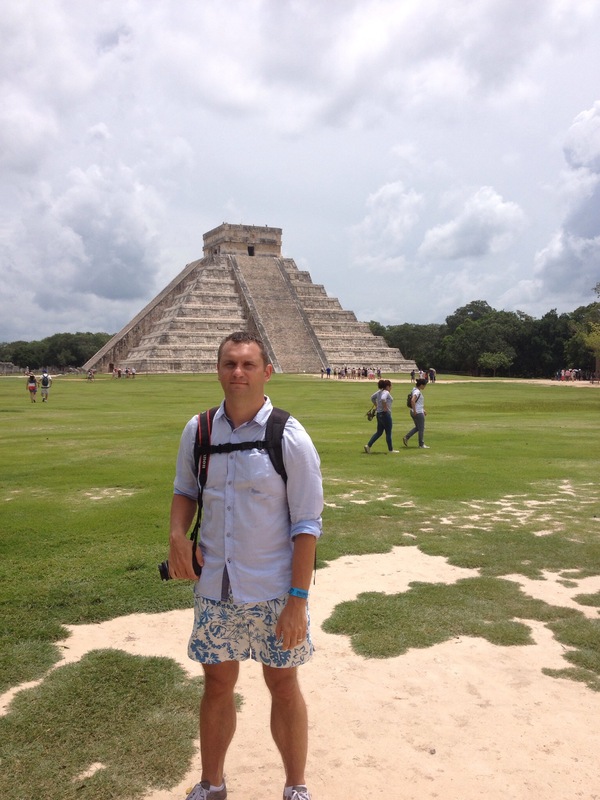 The business works perfectly and the people who organize the tours do care about details. The standards are high, they have guides who speak foreign languages very well, they rent fast and comfortable boats, they offer lunch and drinks. They know how to make extra money, selling gadgets (t-shirts, CDs, photos) renting wetsuits, and providing additional food for extra cash. When you look for a reliable travel agency in Playa, go to Caribe Viaggi which is situated on the corner of the Fifth Avenue and Calle 32. Caribe Viaggi is an Italian travel agency, and the Italians who work there are very helpful and open. They will explain everything to you and offer you some advice. All in all, buying a trip in Playa is not a problem, every fifty meters someone will offer a trip for you. All you need to do is compare different offers and choose the one which is acceptable and suitable for you and your budget. 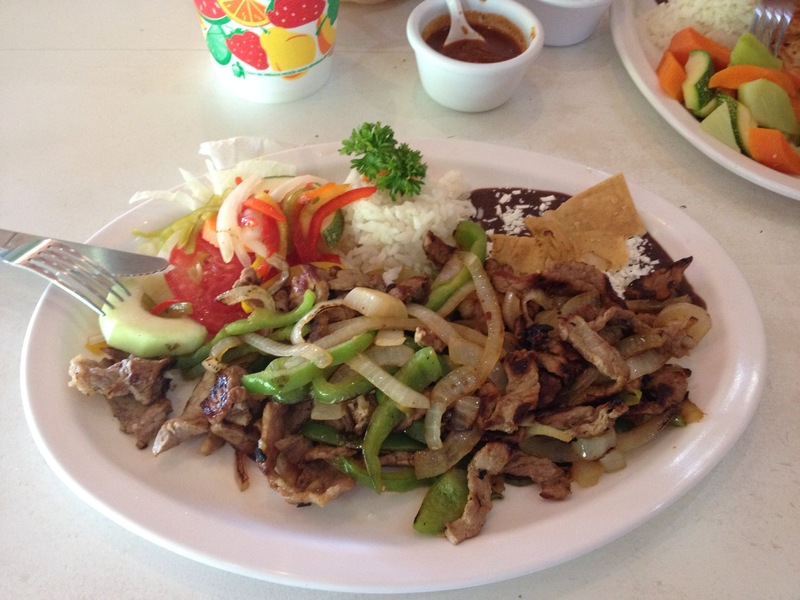 On the corner of Calle 20 and Constituyentes, there is a restaurant called Nativo. They are famous for different types of freshly squized juices in huge mugs. (1liter juices) They use fresh fruits and no artificial ingredients. 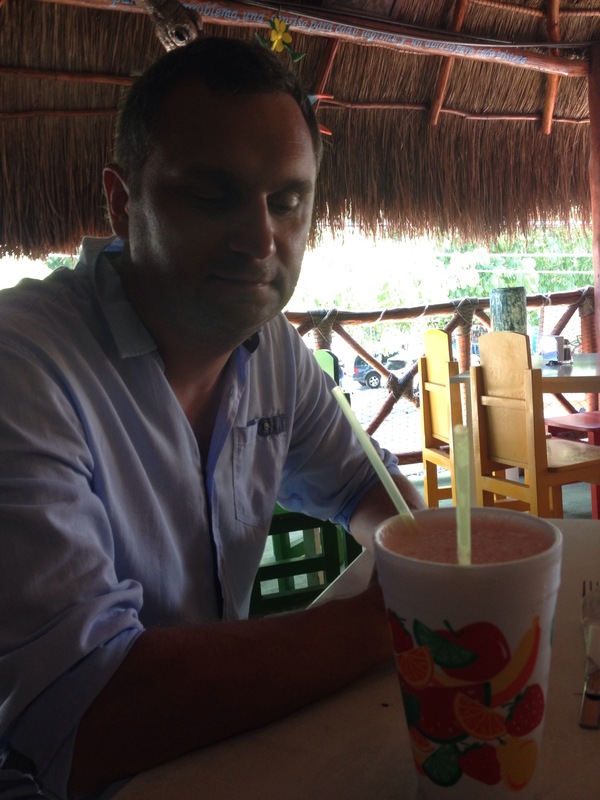 Our choice was CENOTE JUICE: mixed strawberries, pineapple and oranges. It was fantastic.